PATIENT CONDITION: After stem cell treatment for Secondary Progressive Ms, the patient had no side effects and feels energized. Physiotherapy (Lymphatic drainage, Massage, EMF therapy) eliminated almost all the stiffness in legs. Leg pain is almost completely gone ("only dull weak pain"). The patient is very satisfied with lack of memory or speech problems while at the clinic. Her energy levels significantly improved as well as movement coordination. She walks only with crutches while at the clinic. She feels no significant change in sexual dysfunction. The patient psychological state improved but depression is not completely gone. She had one prolonged occurrence of double vision, but it was less intense than before stem cell treatment. Patient condition: 3 months after Stem cell treatment, the patient is very satisfied with improvements in some of the multiple sclerosis symptoms: Speech and Memory problems are eliminated. Muscle stiffness and leg pain is "bearable and quite manageable". The patient used her wheelchair only twice during these three month - both instances due to fatigue, rather than inability to walk with crutches. The least improved symptoms are urinary problems and sexual dysfunction. Energy levels are "high enough", but depression is sometimes still present (not frequent) and double vision occurred twice ("less blurry"). Patient condition: 6 months after the treatment, patient subjective review of her own condition shows improvement in Vision (one, very short occurrence of double vision), Muscle stiffness and leg pain are completely eliminated. Movement coordination improved. The patient can walk with one crutch all the time and seems quite stabile on her feet. Urinary problems and sexual dysfunction still persist. Depression is mild but present. 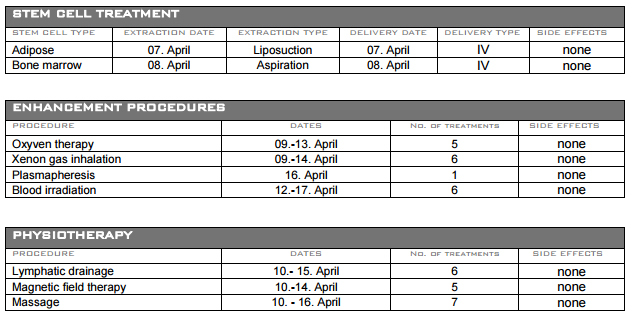 Based on the patient's evaluation on the levels of improvement of her condition (improvements of the symptoms are graded 1-10) we can conclude that her overall condition significantly improved (average rating of 6.20) immediately after stem cell administration. First follow-up evaluation showed additional improvements in all of her symptoms, especially memory and speech problems (average rating of 7.58). Second follow-up evaluation showed additional improvements and complete elimination of some of the symptoms (pain, muscle stiffness). 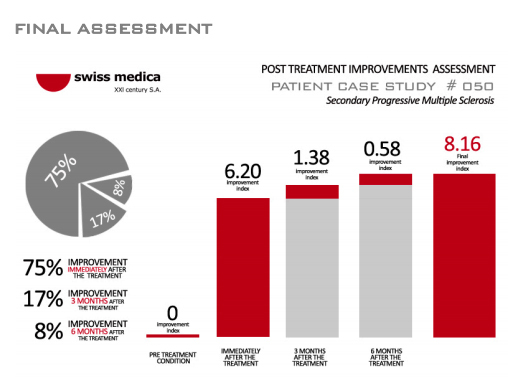 Final improvement rating is 8.16 - patient's condition improved 81,6 % by her own assessment.